The leaders, employees and families of Automated Insights. Windsor Circle on 3/26 at American Underground's send off party. The excitement is tangible in the basement of the American Underground @ Main. Family, friends, and coworkers are gathered for the send-off of two Durham-based startups, Automated Insights and Windsor Circle, before they head to Silicon Valley to pitch to a group of investors at Google for Entrepreneurs Demo Day. Adam Klein, chief strategist at the American Underground, introduced the companies and provided some background information on the event. Google came back a year later with an idea: Google Demo Day. 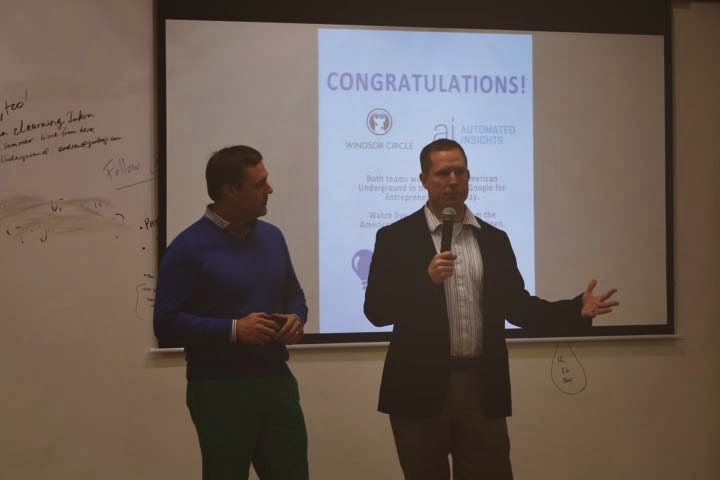 In the midst of March Madness, more than 50 teams from across the Triangle were reviewed for the chance to fly out to California to pitch to investors. In the end, digital analysis company, Automated Insights, and marketing technology company, Winsor Circle, rose to the top. “We worked with partners at CED, Duke University, Groundwork Labs, NC IDEA, RTP, and The Startup Factory to identify the top companies in the area that could not only hold their own at this event but earn substantial investments,” said Klein. Today, Automated Insights and Windsor Circle will visit the Google headquarters in California to present their ideas to more than 100 investors alongside six other startups from Google for Entrepreneur hubs across the country. View the video of the entire event here! I spoke with the CEO of Automated Insights, Robbie Allen, about the trip. When asked about what he’s most excited for, Allen says, “The opportunity to tell our story on a large stage. I’m looking forward to getting more people excited about what we’re doing. And, of course, the warm weather will be nice,” he laughs. Automated Insights uses a Wordsmith platform that takes raw data and turns it into insightful, personalized reports. Essentially, it’s like a computerized expert talking about quantifiable information in plain English. The platform writes with the tone and personality of a human writer. Their clients include Yahoo!, Allstate, Microsoft and, most recently, the Associated Press. On the other hand, Windsor Circle helps online retailers connect their eCommerce platform to their email service provider to send targeted, personalized emails to customers. Their clients include Karma Loop, NPR, Bonobos, and evo. CEO Robbie Allen talk about their excitement in heading to Google. Overall, both companies represent the creativity, ingenuity, and determination that consistently characterize startups in our local entrepreneurial ecosystem. We can’t wait to hear what happens. Join us at the American Tobacco Campus @ Main TODAY from 1-3 to watch a life stream of the Demo Day! The Demo Day pitches will stream live on Google’s YouTube channel.